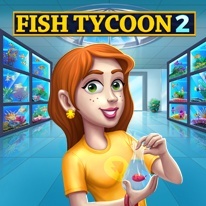 The long awaited Fish Tycoon sequel is finally here! Now you can rediscover and explore the lost magic fish of Isola as you feed, breed, and sell your way from small-time merchant to the ultimate aquatic entrepreneur! Dive into a delightfully fishy adventure of a real-time virtual aquarium with over 400 unique and distinctive fish to discover: it’s an adorable fishtank mania! - Renovate your storefront and reveal special surprises to expand your fish empire! - Nurture and cure your fish using magical plants and marine life! - Research advertising, environment and food to sustain rarer species and increase your revenue!